What if you had a chocolate emergency? 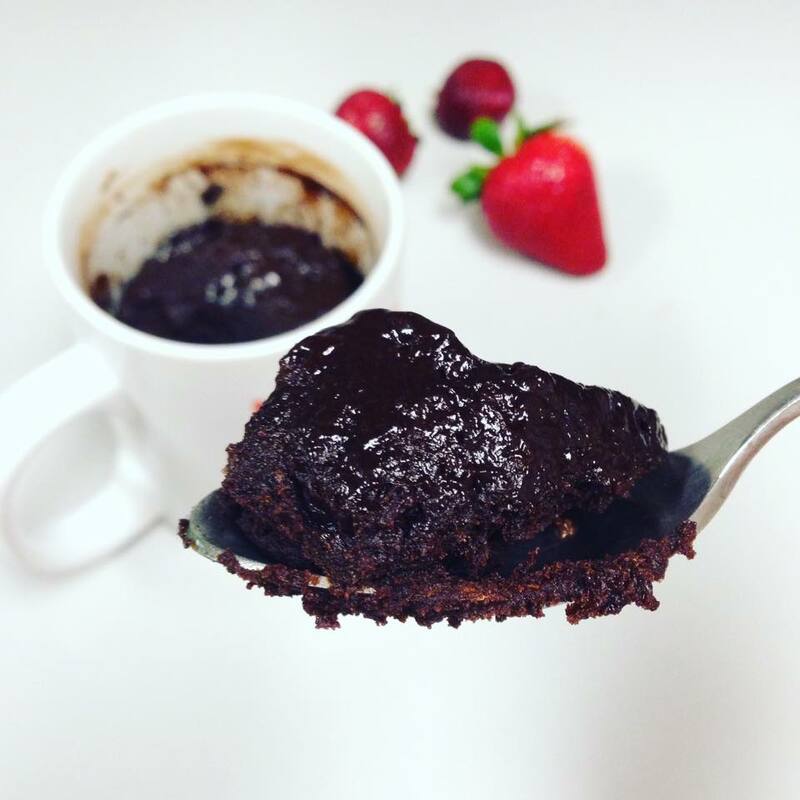 Warm, gooey chocolate cake in a mug would be just the thing, no? Bikini season is here and I am on a diet, faithfully tracking everything I eat on a cute little phone app. Well, today I found a nastygram in my inbox from the good folks at a certain weight loss company, explaining to me that “Warm Chocolate Cake” is not an appropriate way to satisfy my hunger. I promptly uninstalled the app from my phone, set my bikini on fire and went back to my cake. Clearly, these people don’t know what they’re talking about. You don’t eat chocolate cake because you’re hungry. You eat chocolate cake because you want chocolate cake. Sometimes, it’s an emergency. They say the one thing women refuse to give up while dieting is French fries. For me, it’s chocolate and, when I crave it, I make cute, little individual Warm Chocolate Cakes. Luscious, gooey, chocolaty chocolate cake. The creamy texture, the warmth that is just a degree under burning and, best yet, the temporary escape from reality. I swear everything around you goes silent, because all you think, hear, see and taste is this cake. Bake it in the trusty oven the old fashioned way for 10 minutes at 400*F or nuke it for 35 seconds in the microwave. Whichever way you do it is your choice. Just do it. Right now. I don’t know why I love chocolate, but I do. I don’t know why I crave chocolate, but I do. For these reasons, this is a revolutionary recipe. A warm, gooey, heavenly chocolate cake you can make in 35 seconds using the microwave at the office. Unfortunately, this is so convenient that I have gotten into a bit of a habit of lately. The batter can be made in advance and the leftovers keep beautifully in a glass jar in the fridge, ready to go when you feel the need for something decadent. Use the best chocolate you can find. Trader Joe’s Pound Plus dark is widely available, affordable and tastes just lovely. It won’t disappoint. If you really want to splurge, get Lindt, Guittard or Callebaut. This recipe fills 6 standard ramekins. If you’re going to make this at the office instead, drop 4 tablespoons of batter into a ceramic mug and nuke exactly 35 seconds, just in time for breakfast to start your day off properly. Life is Short. Live Luxuriously. It seems that every meal is a struggle for our little sweetheart. We often have to bribe her into finishing her plateful of food. Just last night, I promised her deliver Warm Chocolate Cake, but only if she finished her dinner, which, if you’re wondering, was a bounty of French fries and BBQ ribs. She sure polished that plate clean. There’s an old adage that goes something like this: Eat healthy. Exercise. Die anyway. This could very well stand for my philosophy in life. Life is short. Eat what you like, just remember moderation. Make the batter for this Warm Chocolate Cake and keep it handy for those moments when a chocolate emergency strikes. Every creamy spoonful warms the heart with old fashioned goodness.Who says you have to have lots of money to live luxuriously? « Pineapple Fried Rice Recipe + $500 BBQ Grill Giveaway! Dear Colette, such a fun post- I so enjoyed reading it and right you are! I subscribe to your chocolate philosophy, wholeheartedly! The recipe sounds amazing – a cinch – just perfect for those emergency chocolate moments in all our lives! Hello, my dear friend. I do hope you make these for your family. These are so enjoyable.